Earlier this month one of our brides, Nikki Julian-McKeon, was featured on the popular Wedding Chicks blog. We were so honored to be featured as part of the wedding that we thought we’d share some additional pictures of the rustic chic invitation, save the date, and bridal shower invites we created for her. 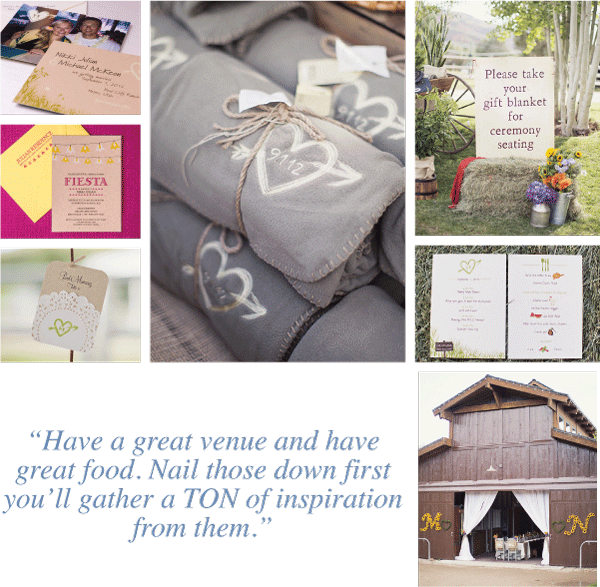 Nikki was a smart cookie and used the heart logo that we designed for her and applied it to details the guests would see on the wedding day like her place cards, menus, and the blankets she had custom made for her guests. Repeating an element like a motif or logo throughout the wedding stationery and all the way through the wedding day is a good way to make sure that your event is memorable. We hope you enjoy a peek into this bride’s dream wedding. An event like Nikki’s needs a team of talented vendors to pull all of the details together and make the event a success. We’re giving a special shout out to Alixann Loosle Photography who’s amazing work captures the moments and details surrounding Nikki and Michael's wedding day. Thank you to Alix!